The Pomodoro technique is a great invention. Everyone who has used on occasionally has proven its usefulness. It’s a great way to avoid stress overload and stay focused throughout the day. It is also a support to avoid procrastination and keep track of your daily life. But all software developers with whom I have spoken, stopped using this technique: despite being convinced of its benefits. The truth is that the Pomodoro technique does not make us feel sufficiently productive. It works well, but the feeling is that you don’t work as much as could. The Pomodoro technique is faulty. Let’s do some maths. If a software developer needs to focus about 15 minutes after a break to continue its work and a full Pomodoro last for 25 minutes. Then, how many minutes has the developer to write code? Just 10 minutes. If we also include the rest time, we left about 20 minutes out of 60 to be productive: too short. We all know that we can work harder. Sometimes we succeeded, even without realizing it and without stress problems. But why sometimes happened this? The solution is to increase the duration of each Pomodoro and their breaks. This does not undermine the principles of the Pomodoro technique. The technique can be used and remains effective. Only the duration of the different phases is changed. It is very important that the Long-Pomodoros last a maximum of 90 minutes: you can not be exceeded. If you do so, breaks must be a minimum of 20 minutes. This period gives us a lot of time for developing our source code. It also avoids falling into states of stress and fatigue. A very important point to consider is the way we rest during the 20 minutes period. Many took advantage of these rest periods to check email or to check Twitter, even to check the next task. The importance of the rest period is not its duration, but its quality. The most suitable is to use some relaxation techniques. The idea is to get away from everything. Put a blank mind and forget the rush and deadlines. It’s recommended work only four-and-a-half hours a given day, in order to avoid exhaustion and recover on a daily or weekly basis. 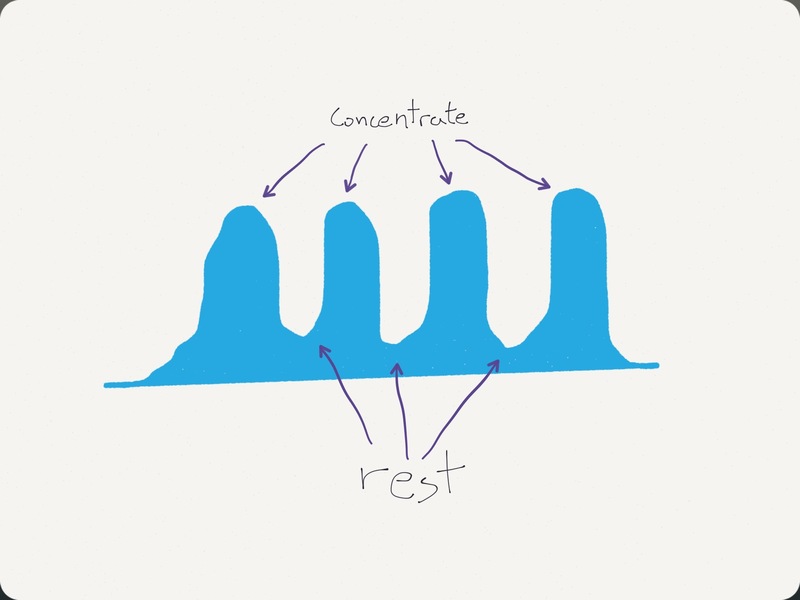 The reason we get stressed when we concentrates for long is cortisol. Human beings are not physically prepared to work long periods of time on tasks that require mental concentration. When the body detects this excessive attention to something, starts generating cortisol. This is the substance that makes us feel tired. It puts us on alert. It makes us feel that something bad is happening. Scientists have proven that the maximum period of concentration on a task is 90 minutes. From the moment you try to avoid further brain thinking, for it generates this cortisol.